Refrigeration is a process of removing heat from a low-temperature reservoir and transferring it to a high-temperature reservoir. The work of heat transfer is traditionally driven by mechanical means, but can also be driven by heat, magnetism, electricity, laser, or other means. Refrigeration has many applications, including, but not limited to: household refrigerators, industrial freezers, cryogenics, and air conditioning. Heat pumps may use the heat output of the refrigeration process, and also may be designed to be reversible, but are otherwise similar to air conditioning units. Refrigeration has had a large impact on industry, lifestyle, agriculture, and settlement patterns. The idea of preserving food dates back to at least the ancient Roman and Chinese empires. However, mechanical refrigeration technology has rapidly evolved in the last century, from ice harvesting to temperature-controlled rail cars. The introduction of refrigerated rail cars contributed to the westward expansion of the United States, allowing settlement in areas that were not on main transport channels such as rivers, harbors, or valley trails. Settlements were also developing in infertile parts of the country, filled with newly discovered natural resources. These new settlement patterns sparked the building of large cities which are able to thrive in areas that were otherwise thought to be inhospitable, such as Houston, Texas, and Las Vegas, Nevada. In most developed countries, cities are heavily dependent upon refrigeration in supermarkets, in order to obtain their food for daily consumption. The increase in food sources has led to a larger concentration of agricultural sales coming from a smaller percentage of existing farms. Farms today have a much larger output per person in comparison to the late 1800s. This has resulted in new food sources available to entire populations, which has had a large impact on the nutrition of society. As quite similar criteria shall be fulfilled by working fluids (refrigerants) applied to heat pumps, refrigeration and ORC cycles, several working fluids are applied by all these technologies. Ammonia was one of the first refrigerants. Refrigeration can be defined as "The science of providing and maintaining temperature below that of surrounding atmosphere". It means continuous extraction of heat from a body whose temperature is already below the temperature of its surroundings. Ice harvesting in Massachusetts, 1852, showing the railroad line in the background, used to transport the ice. Before 1830, few Americans used ice to refrigerate foods due to a lack of ice-storehouses and iceboxes. As these two things became more widely available, individuals used axes and saws to harvest ice for their storehouses. This method proved to be difficult, dangerous, and certainly did not resemble anything that could be duplicated on a commercial scale. Despite the difficulties of harvesting ice, Frederic Tudor thought that he could capitalize on this new commodity by harvesting ice in New England and shipping it to the Caribbean islands as well as the southern states. In the beginning, Tudor lost thousands of dollars, but eventually turned a profit as he constructed icehouses in Charleston, Virginia and in the Cuban port town of Havana. These icehouses as well as better insulated ships helped reduce ice wastage from 66% to 8%. This efficiency gain influenced Tudor to expand his ice market to other towns with icehouses such as New Orleans and Savannah. This ice market further expanded as harvesting ice became faster and cheaper after one of Tudor’s suppliers, Nathaniel Wyeth, invented a horse-drawn ice cutter in 1825. This invention as well as Tudor’s success inspired others to get involved in the ice trade and the ice industry grew. Ice became a mass-market commodity by the early 1830s with the price of ice dropping from six cents per pound to a half of a cent per pound. In New York City, ice consumption increased from 12,000 tons in 1843 to 100,000 tons in 1856. Boston’s consumption leapt from 6,000 tons to 85,000 tons during that same period. Ice harvesting created a “cooling culture” as majority of people used ice and iceboxes to store their dairy products, fish, meat, and even fruits and vegetables. These early cold storage practices paved the way for many Americans to accept the refrigeration technology that would soon take over the country. 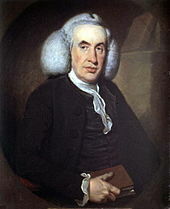 William Cullen, the first to conduct experiments into artificial refrigeration. In 1758, Benjamin Franklin and John Hadley, professor of chemistry, collaborated on a project investigating the principle of evaporation as a means to rapidly cool an object at Cambridge University, England. They confirmed that the evaporation of highly volatile liquids, such as alcohol and ether, could be used to drive down the temperature of an object past the freezing point of water. They conducted their experiment with the bulb of a mercury thermometer as their object and with a bellows used to quicken the evaporation; they lowered the temperature of the thermometer bulb down to 7 °F (−14 °C), while the ambient temperature was 65 °F (18 °C). They noted that soon after they passed the freezing point of water (32 °F), a thin film of ice formed on the surface of the thermometer's bulb and that the ice mass was about a quarter inch thick when they stopped the experiment upon reaching 7 °F (−14 °C). Franklin wrote, "From this experiment, one may see the possibility of freezing a man to death on a warm summer's day". In 1805, American inventor Oliver Evans described a closed vapor-compression refrigeration cycle for the production of ice by ether under vacuum. I am enabled to use volatile fluids for the purpose of producing the cooling or freezing of fluids, and yet at the same time constantly condensing such volatile fluids, and bringing them again into operation without waste. His prototype system worked although it did not succeed commercially. In 1842, a similar attempt was made by American physician, John Gorrie, who built a working prototype, but it was a commercial failure. Like many of the medical experts during this time, Gorrie thought too much exposure to tropical heat led to mental and physical degeneration, as well as the spread of diseases such as malaria. He conceived the idea of using his refrigeration system to cool the air for comfort in homes and hospitals to prevent disease. American engineer Alexander Twining took out a British patent in 1850 for a vapour compression system that used ether. The first practical vapour-compression refrigeration system was built by James Harrison, a British journalist who had emigrated to Australia. His 1856 patent was for a vapour-compression system using ether, alcohol, or ammonia. He built a mechanical ice-making machine in 1851 on the banks of the Barwon River at Rocky Point in Geelong, Victoria, and his first commercial ice-making machine followed in 1854. Harrison also introduced commercial vapour-compression refrigeration to breweries and meat-packing houses, and by 1861, a dozen of his systems were in operation. He later entered the debate of how to compete against the American advantage of unrefrigerated beef sales to the United Kingdom. In 1873 he prepared the sailing ship Norfolk for an experimental beef shipment to the United Kingdom, which used a cold room system instead of a refrigeration system. The venture was a failure as the ice was consumed faster than expected. The first gas absorption refrigeration system using gaseous ammonia dissolved in water (referred to as "aqua ammonia") was developed by Ferdinand Carré of France in 1859 and patented in 1860. Carl von Linde, an engineer specializing in steam locomotives and professor of engineering at the Technological University of Munich in Germany, began researching refrigeration in the 1860s and 1870s in response to demand from brewers for a technology that would allow year-round, large-scale production of lager; he patented an improved method of liquefying gases in 1876. His new process made possible using gases such as ammonia, sulfur dioxide (SO2) and methyl chloride (CH3Cl) as refrigerants and they were widely used for that purpose until the late 1920s. Thaddeus Lowe, an American balloonist, held several patents on ice-making machines. His "Compression Ice Machine" would revolutionize the cold-storage industry. In 1869 other investors and he purchased an old steamship onto which they loaded one of Lowe's refrigeration units and began shipping fresh fruit from New York to the Gulf Coast area, and fresh meat from Galveston, Texas back to New York, but because of Lowe's lack of knowledge about shipping, the business was a costly failure. An 1870 refrigerator car design. Hatches in the roof provided access to the tanks for the storage of harvested ice at each end. 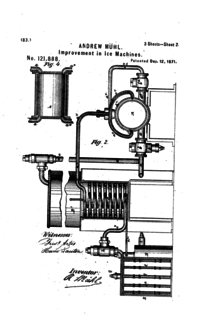 Icemaker Patent by Andrew Muhl, dated December 12, 1871. In 1842 John Gorrie created a system capable of refrigerating water to produce ice. Although it was a commercial failure, it inspired scientists and inventors around the world. France’s Ferdinand Carre was one of the inspired and he created an ice producing system that was simpler and smaller than that of Gorrie. During the Civil War, cities such as New Orleans could no longer get ice from New England via the coastal ice trade. Carre’s refrigeration system became the solution to New Orleans ice problems and by 1865 the city had three of Carre’s machines. In 1867, in San Antonio, Texas, a French immigrant named Andrew Muhl built an ice-making machine to help service the expanding beef industry before moving it to Waco in 1871. In 1873, the patent for this machine was contracted by the Columbus Iron Works, a company acquired by the W.C. Bradley Co., which went on to produce the first commercial ice-makers in the US. By the 1870s breweries had become the largest users of harvested ice. Though the ice-harvesting industry had grown immensely by the turn of the 20th century, pollution and sewage had begun to creep into natural ice, making it a problem in the metropolitan suburbs. Eventually, breweries began to complain of tainted ice. Public concern for the purity of water, from which ice was formed, began to increase in the early 1900s with the rise of germ theory. Numerous media outlets published articles connecting diseases such as typhoid fever with natural ice consumption. This caused ice harvesting to become illegal in certain areas of the country. All of these scenarios increased the demands for modern refrigeration and manufactured ice. Ice producing machines like that of Carre’s and Muhl’s were looked to as means of producing ice to meet the needs of grocers, farmers, and food shippers. Refrigerated railroad cars were introduced in the US in the 1840s for short-run transport of dairy products, but these used harvested ice to maintain a cool temperature. Dunedin, the first commercially successful refrigerated ship. The new refrigerating technology first met with widespread industrial use as a means to freeze meat supplies for transport by sea in reefer ships from the British Dominions and other countries to the British Isles. The first to achieve this breakthrough was an entrepreneur who had emigrated to New Zealand. William Soltau Davidson thought that Britain's rising population and meat demand could mitigate the slump in world wool markets that was heavily affecting New Zealand. After extensive research, he commissioned the Dunedin to be refitted with a compression refrigeration unit for meat shipment in 1881. On February 15, 1882, the Dunedin sailed for London with what was to be the first commercially successful refrigerated shipping voyage, and the foundation of the refrigerated meat industry. The Times commented "Today we have to record such a triumph over physical difficulties, as would have been incredible, even unimaginable, a very few days ago...". The Marlborough—sister ship to the Dunedin – was immediately converted and joined the trade the following year, along with the rival New Zealand Shipping Company vessel Mataurua, while the German Steamer Marsala began carrying frozen New Zealand lamb in December 1882. Within five years, 172 shipments of frozen meat were sent from New Zealand to the United Kingdom, of which only 9 had significant amounts of meat condemned. Refrigerated shipping also led to a broader meat and dairy boom in Australasia and South America. J & E Hall of Dartford, England outfitted the 'SS Selembria' with a vapor compression system to bring 30,000 carcasses of mutton from the Falkland Islands in 1886. In the years ahead, the industry rapidly expanded to Australia, Argentina and the United States. By the 1890s refrigeration played a vital role in the distribution of food. The meat-packing industry relied heavily on natural ice in the 1880s and continued to rely on manufactured ice as those technologies became available. By 1900, the meat-packing houses of Chicago had adopted ammonia-cycle commercial refrigeration. By 1914 almost every location used artificial refrigeration. The major meat packers, Armour, Swift, and Wilson, had purchased the most expensive units which they installed on train cars and in branch houses and storage facilities in the more remote distribution areas. By the middle of the 20th century, refrigeration units were designed for installation on trucks or lorries. Refrigerated vehicles are used to transport perishable goods, such as frozen foods, fruit and vegetables, and temperature-sensitive chemicals. Most modern refrigerators keep the temperature between –40 and –20 °C, and have a maximum payload of around 24,000 kg gross weight (in Europe). Although commercial refrigeration quickly progressed, it had limitations that prevented it from moving into the household. First, most refrigerators were far too large. Some of the commercial units being used in 1910 weighed between five and two hundred tons. Second, commercial refrigerators were expensive to produce, purchase, and maintain. Lastly, these refrigerators were unsafe. It was not uncommon for commercial refrigerators to catch fire, explode, or leak toxic gases. Refrigeration did not become a household technology until these three challenges were overcome. 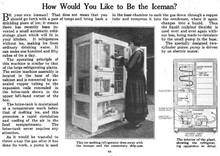 An early example of the consumerization of mechanical refrigeration that began in the early 20th century. The refrigerant was sulfur dioxide. During the early 1800s consumers preserved their food by storing food and ice purchased from ice harvesters in iceboxes. In 1803, Thomas Moore patented a metal-lined butter-storage tub which became the prototype for most iceboxes. These iceboxes were used until nearly 1910 and the technology did not progress. In fact, consumers that used the icebox in 1910 faced the same challenge of a moldy and stinky icebox that consumers had in the early 1800s. General Electric (GE) was one of the first companies to overcome these challenges. In 1911 GE released a household refrigeration unit that was powered by gas. The use of gas eliminated the need for an electric compressor motor and decreased the size of the refrigerator. However, electric companies that were customers of GE did not benefit from a gas-powered unit. Thus, GE invested in developing an electric model. In 1927, GE released the Monitor Top, the first refrigerator to run on electricity. In 1930, Frigidaire, one of GE’s main competitors, synthesized Freon. With the invention of synthetic refrigerants based mostly on a chlorofluorocarbon (CFC) chemical, safer refrigerators were possible for home and consumer use. Freon led to the development of smaller, lighter, and cheaper refrigerators. The average price of a refrigerator dropped from $275 to $154 with the synthesis of Freon. This lower price allowed ownership of refrigerators in American households to exceed 50%. Freon is a trademark of the DuPont Corporation and refers to these CFCs, and later hydro chlorofluorocarbon (HCFC) and hydro fluorocarbon (HFC), refrigerants developed in the late 1920s. These refrigerants were considered at the time to be less harmful than the commonly-used refrigerants of the time, including methyl formate, ammonia, methyl chloride, and sulfur dioxide. The intent was to provide refrigeration equipment for home use without danger. These CFC refrigerants answered that need. In the 1970s, though, the compounds were found to be reacting with atmospheric ozone, an important protection against solar ultraviolet radiation, and their use as a refrigerant worldwide was curtailed in the Montreal Protocol of 1987. In the last century refrigeration allowed new settlement patterns to emerge. This new technology has allowed for new areas to be settled that are not on a natural channel of transport such as a river, valley trail or harbor that may have otherwise not been settled. Refrigeration has given opportunities to early settlers to expand westward and into rural areas that were unpopulated. These new settlers with rich and untapped soil saw opportunity to profit by sending raw goods to the eastern cities and states. In the 20th century, refrigeration has made “Galactic Cities” such as Dallas, Phoenix and Los Angeles possible. The refrigerated rail car (refrigerated van or refrigerator car), along with the dense railroad network, became an exceedingly important link between the marketplace and the farm allowing for a national opportunity rather than a just a regional one. Before the invention of the refrigerated rail car it was impossible to ship perishable food products long distances. The beef packing industry made the first demand push for refrigeration cars. The railroad companies were slow to adopt this new invention because of their heavy investments in cattle cars, stockyards, and feedlots. Refrigeration cars were also complex and costly compared to other rail cars, which also slowed the adoption of the refrigerated rail car. After the slow adoption of the refrigerated car, the beef packing industry dominated the refrigerated rail car business with their ability to control ice plants and the setting of icing fees. The United States Department of Agriculture estimated that in 1916 over sixty-nine percent of the cattle killed in the country was done in plants involved in interstate trade. The same companies that were also involved in the meat trade later implemented refrigerated transport to include vegetables and fruit. The meat packing companies had much of the expensive machinery, such as refrigerated cars, and cold storage facilities that allowed for them to effectively distribute all types of perishable goods. During World War I, a national refrigerator car pool was established by the United States Administration to deal with problem of idle cars and was later continued after the war. The idle car problem was the problem of refrigeration cars sitting pointlessly in between seasonal harvests. This meant that very expensive cars sat in rail yards for a good portion of the year while making no revenue for the car’s owner. The car pool was a system where cars were distributed to areas as crops matured ensuring maximum use of the cars. Refrigerated rail cars moved eastward from vineyards, orchards, fields, and gardens in western states to satisfy Americas consuming market in the east. The refrigerated car made it possible to transport perishable crops hundreds and even thousands of miles. The most noticeable effect the car gave was a regional specialization of vegetables and fruits. The refrigeration rail car was widely used for the transportation of perishable goods up until the 1950s. By the 1960s the nation's interstate highway system was adequately complete allowing for trucks to carry the majority of the perishable food loads and to push out the old system of the refrigerated rail cars. The widespread use of refrigeration allowed for a vast amount of new agricultural opportunities to open up in the United States. New markets emerged throughout the United States in areas that were previously uninhabited and far-removed from heavily populated areas. New agricultural opportunity presented itself in areas that were considered rural such as states in the south and in the west. Shipments on a large scale from the south and California were both made around the same time although natural ice was used from the Sierras in California rather than manufactured ice in the south. Refrigeration allowed for many areas to specialize in the growing of specific fruits. California specialized in several fruits, grapes, peaches, pears, plums, and apples while Georgia became famous for specifically its peaches. In California, the acceptance of the refrigerated rail carts lead to an increase of car loads from 4,500 carloads in 1895 to between 8,000 and 10,000 carloads in 1905. The Gulf States, Arkansas, Missouri and Tennessee entered into strawberry production on a large-scale while Mississippi became the center of the tomato industry. New Mexico, Colorado, Arizona, and Nevada grew cantaloupes. Without refrigeration this would have not been possible. By 1917, well-established fruit and vegetable areas that were close to eastern markets felt the pressure of competition from these distant specialized centers. Refrigeration was not limited to meat, fruit and vegetables but it also encompassed dairy product and dairy farms. In the early twentieth century large cities got their dairy supply from farms as far as 400 miles. Dairy products were not as easily transported great distances like fruits and vegetables due to greater perishability. Refrigeration made production possible in the west far from eastern markets, so much in fact that dairy farmers could pay transportation cost and still undersell their eastern competitors. Refrigeration and the refrigerated rail gave opportunity to areas with rich soil far from natural channel of transport such as a river, valley trail or harbors. "Edge city" was a term coined by Joel Garreau, whereas the term "galactic city" was coined by Lewis Mumford. These terms refer to a concentration of business, shopping, and entertainment outside a traditional downtown or central business district in what had previously been a residential or rural area. There were several factors contributing to the growth of these cities such as Los Angeles, Las Vegas, Houston, and Phoenix. The factors that contributed to these large cities include reliable automobiles, highway systems, refrigeration, and agricultural production increases. Large cities such as the ones mentioned above have not been uncommon in history but what separates these cities from the rest are that these cities are not along some natural channel of transport, or at some crossroad of two or more channels such as a trail, harbor, mountain, river, or valley. These large cities have been developed in areas that only a few hundred years ago would have been uninhabitable. Without a cost efficient way of cooling air and transporting water and food great distances these large cities would have never developed. The rapid growth of these cities was influenced by refrigeration and an agricultural productivity increase, allowing more distant farms to effectively feed the population. Agriculture’s role in developed countries has drastically changed in the last century due to many factors, including refrigeration. Statistics from the 2007 census gives information on the large concentration of agricultural sales coming from a small portion of the existing farms in the United States today. This is a partial result of the market created for the frozen meat trade by the first successful shipment of frozen sheep carcasses coming from New Zealand in the 1880s. As the market continued to grow, regulations on food processing and quality began to be enforced. Eventually, electricity was introduced into rural homes in the United States, which allowed refrigeration technology to continue to expand on the farm, increasing output per person. Today, refrigeration’s use on the farm reduces humidity levels, avoids spoiling due to bacterial growth, and assists in preservation. The introduction of refrigeration and evolution of additional technologies drastically changed agriculture in the United States. During the beginning of the 20th century, farming was a common occupation and lifestyle for United States citizens, as most farmers actually lived on their farm. In 1935, there were 6.8 million farms in the United States and a population of 127 million. Yet, while the United States population has continued to climb, citizens pursuing agriculture continue to decline. Based on the 2007 US Census, less than one percent of a population of 310 million people claim farming as an occupation today. However, the increasing population has led to an increasing demand for agricultural products, which is met through a greater variety of crops, fertilizers, pesticides, and improved technology. Improved technology has decreased the risk and time involved if agricultural management and allows larger farms to increase their output per person to meet society’s demand. Prior to 1882, the South Island of New Zealand had been experimenting with sowing grass and crossbreeding sheep, which immediately gave their farmers economic potential in the exportation of meat. In 1882, the first successful shipment of sheep carcasses was sent from Port Chalmers in Dunedin, New Zealand, to London. By the 1890s, the frozen meat trade became increasingly more profitable in New Zealand, especially in Canterbury, where 50% of exported sheep carcasses came from in 1900. It wasn’t long before Canterbury meat was known for the highest quality, creating a demand for New Zealand meat around the world. In order to meet this new demand, the farmers improved their feed so sheep could be ready for the slaughter in only seven months. This new method of shipping led to an economic boom in New Zealand by the mid 1890s. In the United States, the Meat Inspection Act of 1891 was put in place in the United States because local butchers felt the refrigerated railcar system was unwholesome. When meat packing began to take off, consumers became nervous about the quality of the meat for consumption. Upton Sinclair's 1906 novel The Jungle brought negative attention to the meat packing industry, by drawing to light unsanitary working conditions and processing of diseased animals. The book caught the attention of President Theodore Roosevelt, and the 1906 Meat Inspection Act was put into place as an amendment to the Meat Inspection Act of 1891. This new act focused on the quality of the meat and environment it is processed in. In the early 1930s, 90 percent of the urban population of the United States had electric power, in comparison to only 10 percent of rural homes. At the time, power companies did not feel that extending power to rural areas (rural electrification) would produce enough profit to make it worth their while. However, in the midst of the Great Depression, President Franklin D. Roosevelt realized that rural areas would continue to lag behind urban areas in both poverty and production if they were not electrically wired. On May 11, 1935, the president signed an executive order called the Rural Electrification Administration, also known as REA. The agency provided loans to fund electric infrastructure in the rural areas. In just a few years, 300,000 people in rural areas of the United States had received power in their homes. While electricity dramatically improved working conditions on farms, it also had a large impact on the safety of food production. Refrigeration systems were introduced to the farming and food distribution processes, which helped in food preservation and kept food supplies safe. Refrigeration also allowed for production of perishable commodities, which could then be shipped throughout the United States. As a result, the United States farmers quickly became the most productive in the world, and entire new food systems arose. In order to reduce humidity levels and spoiling due to bacterial growth, refrigeration is used for meat, produce, and dairy processing in farming today. Refrigeration systems are used the heaviest in the warmer months for farming produce, which must be cooled as soon as possible in order to meet quality standards and increase the shelf life. Meanwhile, dairy farms refrigerate milk year round to avoid spoiling. In the late 19th Century and into the very early 20th Century, except for staple foods (sugar, rice, and beans) that needed no refrigeration, the available foods were affected heavily by the seasons and what could be grown locally. Refrigeration has removed these limitations. Refrigeration played a large part in the feasibility and then popularity of the modern supermarket. Fruits and vegetables out of season, or grown in distant locations, are now available at relatively low prices. Refrigerators have led to a huge increase in meat and dairy products as a portion of overall supermarket sales. As well as changing the goods purchased at the market, the ability to store these foods for extended periods of time has led to an increase in leisure time. Prior to the advent of the household refrigerator, people would have to shop on a daily basis for the supplies needed for their meals. The introduction of refrigeration allowed for the hygienic handling and storage of perishables, and as such, promoted output growth, consumption, and the availability of nutrition. The change in our method of food preservation moved us away from salts to a more manageable sodium level. The ability to move and store perishables such as meat and dairy led to a 1.7% increase in dairy consumption and overall protein intake by 1.25% annually in the US after the 1890s. People were not only consuming these perishables because it became easier for they themselves to store them, but because the innovations in refrigerated transportation and storage led to less spoilage and waste, thereby driving the prices of these products down. 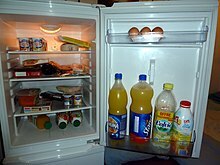 Refrigeration accounts for at least 5.1% of the increase in adult stature (in the US) through improved nutrition, and when the indirect effects associated with improvements in the quality of nutrients and the reduction in illness is additionally factored in, the overall impact becomes considerably larger. Recent studies have also shown a negative relationship between the number of refrigerators in a household and the rate of gastric cancer mortality. Probably the most widely used current applications of refrigeration are for air conditioning of private homes and public buildings, and refrigerating foodstuffs in homes, restaurants and large storage warehouses. The use of refrigerators in kitchens for storing fruits and vegetables has allowed adding fresh salads to the modern diet year round, and storing fish and meats safely for long periods. Optimum temperature range for perishable food storage is 3 to 5 °C (37 to 41 °F). In commerce and manufacturing, there are many uses for refrigeration. Refrigeration is used to liquify gases – oxygen, nitrogen, propane and methane, for example. In compressed air purification, it is used to condense water vapor from compressed air to reduce its moisture content. In oil refineries, chemical plants, and petrochemical plants, refrigeration is used to maintain certain processes at their needed low temperatures (for example, in alkylation of butenes and butane to produce a high octane gasoline component). Metal workers use refrigeration to temper steel and cutlery. When transporting temperature-sensitive foodstuffs and other materials by trucks, trains, airplanes and seagoing vessels, refrigeration is a necessity. Dairy products are constantly in need of refrigeration, and it was only discovered in the past few decades that eggs needed to be refrigerated during shipment rather than waiting to be refrigerated after arrival at the grocery store. Meats, poultry and fish all must be kept in climate-controlled environments before being sold. Refrigeration also helps keep fruits and vegetables edible longer. One of the most influential uses of refrigeration was in the development of the sushi/sashimi industry in Japan. Before the discovery of refrigeration, many sushi connoisseurs were at risk of contracting diseases. The dangers of unrefrigerated sashimi were not brought to light for decades due to the lack of research and healthcare distribution across rural Japan. Around mid-century, the Zojirushi corporation, based in Kyoto, made breakthroughs in refrigerator designs, making refrigerators cheaper and more accessible for restaurant proprietors and the general public. Methods of refrigeration can be classified as non-cyclic, cyclic, thermoelectric and magnetic. This refrigeration method cools a contained area by melting ice, or by sublimating dry ice. Perhaps the simplest example of this is a portable cooler, where items are put in it, then ice is poured over the top. Regular ice can maintain temperatures near, but not below the freezing point, unless salt is used to cool the ice down further (as in a traditional ice-cream maker). Dry ice can reliably bring the temperature well below freezing. This consists of a refrigeration cycle, where heat is removed from a low-temperature space or source and rejected to a high-temperature sink with the help of external work, and its inverse, the thermodynamic power cycle. In the power cycle, heat is supplied from a high-temperature source to the engine, part of the heat being used to produce work and the rest being rejected to a low-temperature sink. This satisfies the second law of thermodynamics. A refrigeration cycle describes the changes that take place in the refrigerant as it alternately absorbs and rejects heat as it circulates through a refrigerator. It is also applied to heating, ventilation, and air conditioning HVACR work, when describing the "process" of refrigerant flow through an HVACR unit, whether it is a packaged or split system. Heat naturally flows from hot to cold. Work is applied to cool a living space or storage volume by pumping heat from a lower temperature heat source into a higher temperature heat sink. Insulation is used to reduce the work and energy needed to achieve and maintain a lower temperature in the cooled space. The operating principle of the refrigeration cycle was described mathematically by Sadi Carnot in 1824 as a heat engine. The most common types of refrigeration systems use the reverse-Rankine vapor-compression refrigeration cycle, although absorption heat pumps are used in a minority of applications. The vapor-compression cycle is used in most household refrigerators as well as in many large commercial and industrial refrigeration systems. 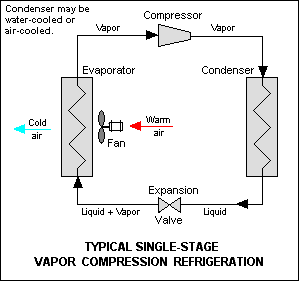 Figure 1 provides a schematic diagram of the components of a typical vapor-compression refrigeration system. The thermodynamics of the cycle can be analyzed on a diagram as shown in Figure 2. In this cycle, a circulating refrigerant such as Freon enters the compressor as a vapor. 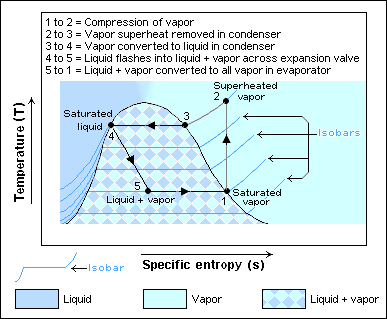 From point 1 to point 2, the vapor is compressed at constant entropy and exits the compressor as a vapor at a higher temperature, but still below the vapor pressure at that temperature. From point 2 to point 3 and on to point 4, the vapor travels through the condenser which cools the vapor until it starts condensing, and then condenses the vapor into a liquid by removing additional heat at constant pressure and temperature. Between points 4 and 5, the liquid refrigerant goes through the expansion valve (also called a throttle valve) where its pressure abruptly decreases, causing flash evaporation and auto-refrigeration of, typically, less than half of the liquid. That results in a mixture of liquid and vapor at a lower temperature and pressure as shown at point 5. The cold liquid-vapor mixture then travels through the evaporator coil or tubes and is completely vaporized by cooling the warm air (from the space being refrigerated) being blown by a fan across the evaporator coil or tubes. The resulting refrigerant vapor returns to the compressor inlet at point 1 to complete the thermodynamic cycle. The above discussion is based on the ideal vapor-compression refrigeration cycle, and does not take into account real-world effects like frictional pressure drop in the system, slight thermodynamic irreversibility during the compression of the refrigerant vapor, or non-ideal gas behavior, if any. More information about the design and performance of vapor-compression refrigeration systems is available in the classic Perry's Chemical Engineers' Handbook. In the early years of the twentieth century, the vapor absorption cycle using water-ammonia systems was popular and widely used. After the development of the vapor compression cycle, the vapor absorption cycle lost much of its importance because of its low coefficient of performance (about one fifth of that of the vapor compression cycle). Today, the vapor absorption cycle is used mainly where fuel for heating is available but electricity is not, such as in recreational vehicles that carry LP gas. It is also used in industrial environments where plentiful waste heat overcomes its inefficiency. The absorption cycle is similar to the compression cycle, except for the method of raising the pressure of the refrigerant vapor. In the absorption system, the compressor is replaced by an absorber which dissolves the refrigerant in a suitable liquid, a liquid pump which raises the pressure and a generator which, on heat addition, drives off the refrigerant vapor from the high-pressure liquid. Some work is needed by the liquid pump but, for a given quantity of refrigerant, it is much smaller than needed by the compressor in the vapor compression cycle. In an absorption refrigerator, a suitable combination of refrigerant and absorbent is used. The most common combinations are ammonia (refrigerant) with water (absorbent), and water (refrigerant) with lithium bromide (absorbent). When the working fluid is a gas that is compressed and expanded but doesn't change phase, the refrigeration cycle is called a gas cycle. Air is most often this working fluid. As there is no condensation and evaporation intended in a gas cycle, components corresponding to the condenser and evaporator in a vapor compression cycle are the hot and cold gas-to-gas heat exchangers in gas cycles. The gas cycle is less efficient than the vapor compression cycle because the gas cycle works on the reverse Brayton cycle instead of the reverse Rankine cycle. As such the working fluid does not receive and reject heat at constant temperature. In the gas cycle, the refrigeration effect is equal to the product of the specific heat of the gas and the rise in temperature of the gas in the low temperature side. Therefore, for the same cooling load, a gas refrigeration cycle needs a large mass flow rate and is bulky. Because of their lower efficiency and larger bulk, air cycle coolers are not often used nowadays in terrestrial cooling devices. However, the air cycle machine is very common on gas turbine-powered jet aircraft as cooling and ventilation units, because compressed air is readily available from the engines' compressor sections. Such units also serve the purpose of pressurizing the aircraft. Thermoelectric cooling uses the Peltier effect to create a heat flux between the junction of two types of material. This effect is commonly used in camping and portable coolers and for cooling electronic components and small instruments. Magnetic refrigeration, or adiabatic demagnetization, is a cooling technology based on the magnetocaloric effect, an intrinsic property of magnetic solids. The refrigerant is often a paramagnetic salt, such as cerium magnesium nitrate. The active magnetic dipoles in this case are those of the electron shells of the paramagnetic atoms. A strong magnetic field is applied to the refrigerant, forcing its various magnetic dipoles to align and putting these degrees of freedom of the refrigerant into a state of lowered entropy. A heat sink then absorbs the heat released by the refrigerant due to its loss of entropy. Thermal contact with the heat sink is then broken so that the system is insulated, and the magnetic field is switched off. This increases the heat capacity of the refrigerant, thus decreasing its temperature below the temperature of the heat sink. Because few materials exhibit the needed properties at room temperature, applications have so far been limited to cryogenics and research. Other methods of refrigeration include the air cycle machine used in aircraft; the vortex tube used for spot cooling, when compressed air is available; and thermoacoustic refrigeration using sound waves in a pressurized gas to drive heat transfer and heat exchange; steam jet cooling popular in the early 1930s for air conditioning large buildings; thermoelastic cooling using a smart metal alloy stretching and relaxing. Many Stirling cycle heat engines can be run backwards to act as a refrigerator, and therefore these engines have a niche use in cryogenics. In addition there are other types of cryocoolers such as Gifford-McMahon coolers, Joule-Thomson coolers, pulse-tube refrigerators and, for temperatures between 2 mK and 500 mK, dilution refrigerators. Another potential solid-state refrigeration technique and a relatively new area of study comes from a special property of super elastic materials. These materials undergo a temperature change when experiencing an applied mechanical stress (called the elastocaloric effect). Since super elastic materials deform reversibly at high strains, the material experiences a flattened elastic region in its stress-strain curve caused by a resulting phase transformation from an austenitic to a martensitic crystal phase. When a super elastic material experiences a stress in the austenitic phase, it undergoes an exothermic phase transformation to the martensitic phase, which causes the material to heat up. Removing the stress reverses the process, restores the material to its austenitic phase, and absorbs heat from the surroundings cooling down the material. The most appealing part of this research is how potentially energy efficient and environmentally friendly this cooling technology is. The different materials used, commonly shape-memory alloys, provide a non-toxic source of emission free refrigeration. The most commonly studied materials studied are shape-memory alloys, like nitinol and Cu-Zn-Al. Nitinol is of the more promising alloys with output heat at about 66 J/cm3 and a temperature change of about 16–20 K. Due to the difficulty in manufacturing some of the shape memory alloys, alternative materials like natural rubber have been studied. Even though rubber may not give off as much heat per volume (12 J/cm3 ) as the shape memory alloys, it still generates a comparable temperature change of about 12 K and operates at a suitable temperature range, low stresses, and low cost. The main challenge however comes from potential energy losses in the form of hysteresis, often associated with this process. Since most of these losses comes from incompatibilities between the two phases, proper alloy tuning is necessary to reduce losses and increase reversibility and efficiency. Balancing the transformation strain of the material with the energy losses enables a large elastocaloric effect to occur and potentially a new alternative for refrigeration. The Fridge Gate method is a theoretical application of using a single logic gate to drive a refrigerator in the most energy efficient way possible without violating the laws of thermodynamics. It operates on the fact that there are two energy states in which a particle can exist: the ground state and the excited state. The excited state carries a little more energy than the ground state, small enough so that the transition occurs with high probability. There are three components or particle types associated with the fridge gate. The first is on the interior of the fridge, the second on the outside and the third is connected to a power supply which heats up every so often that it can reach the E state and replenish the source. In the cooling step on the inside of the fridge, the g state particle absorbs energy from ambient particles, cooling them, and itself jumping to the e state. In the second step, on the outside of the fridge where the particles are also at an e state, the particle falls to the g state, releasing energy and heating the outside particles. In the third and final step, the power supply moves a particle at the e state, and when it falls to the g state it induces an energy-neutral swap where the interior e particle is replaced by a new g particle, restarting the cycle. A refrigeration system's coefficient of performance (CoP) is very important in determining a system's overall efficiency. It is defined as refrigeration capacity in kW divided by the energy input in kW. While CoP is a very simple measure of performance, it is typically not used for industrial refrigeration in North America. Owners and manufacturers of these systems typically use performance factor (PF). A system's PF is defined as a system's energy input in horsepower divided by its refrigeration capacity in TR. Both CoP and PF can be applied to either the entire system or to system components. For example, an individual compressor can be rated by comparing the energy needed to run the compressor versus the expected refrigeration capacity based on inlet volume flow rate. It is important to note that both CoP and PF for a refrigeration system are only defined at specific operating conditions, including temperatures and thermal loads. Moving away from the specified operating conditions can dramatically change a system's performance. ^ Neuburger, Albert (2003). The technical arts and sciences of the ancients. London: Kegan Paul. p. 122. ISBN 978-0-7103-0755-2. ^ Neuburger, Albert (2003). The technical arts and sciences of the ancients. London: Kegan Paul. pp. 122–124. ISBN 978-0-7103-0755-2. ^ Anderson, Oscar Edward (1953). Refrigeration in America; a history of a new technology and its impact. Princeton: Published for the University of Cincinnati by Princeton University Press. pp. 5–6. ISBN 978-0-8046-1621-8. ^ Anderson, Oscar Edward (1953). Refrigeration in America; a history of a new technology and its impact. Princeton: Published for the University of Cincinnati by Princeton University Press. pp. 8–11. ISBN 978-0-8046-1621-8. ^ Anderson, Oscar Edward (1953). Refrigeration in America; a history of a new technology and its impact. Princeton: Published for the University of Cincinnati by Princeton University Press. pp. 11–13. ISBN 978-0-8046-1621-8. ^ Freidberg, Susanne (2010). Fresh: a perishable history (1st Harvard University Press pbk. ed.). Cambridge, MA: Belknap. pp. 20–23. ISBN 978-0-674-05722-7. ^ Arora, Ramesh Chandra (2012). "Mechanical vapour compression refrigeration". Refrigeration and Air Conditioning. New Delhi: PHI Learning. p. 3. ISBN 978-81-203-3915-6. ^ Burstall, Aubrey F. (1965). A History of Mechanical Engineering. The MIT Press. ISBN 978-0-262-52001-0. ^ Freidberg, Susanne (2010). Fresh : a perishable history (1st Harvard University Press pbk. ed.). Cambridge, MA: Belknap. p. 23. ISBN 978-0-674-05722-7. ^ James Burke (1979). "Eat, Drink, and Be Merry". Connections. Episode 8. 41–49 minutes in. BBC. ^ Anderson, Oscar Edward (1953). Refrigeration in America; a history of a new technology and its impact. Princeton: Published for the University of Cincinnati by Princeton University Press. p. 25. ISBN 978-0-8046-1621-8. ^ Freidberg, Susanne (2010). Fresh : a perishable history (1st Harvard University Press pbk. ed.). Cambridge, MA: Belknap. p. 25. ISBN 978-0-674-05722-7. ^ Anderson, Oscar Edward (1953). Refrigeration in America; a history of a new technology and its impact. Princeton: Published for the University of Cincinnati by Princeton University Press. pp. 110–111. ISBN 978-0-8046-1621-8. ^ Refrigeration, Texas State Historical Association. ^ Colin Williscroft (2007). A lasting Legacy – A 125 year history of New Zealand Farming since the first Frozen Meat Shipment. NZ Rural Press Limited. ^ Freidberg, Susanne (2010). Fresh : a perishable history (1st Harvard University Press pbk. ed.). Cambridge, MA: Belknap. p. 142. ISBN 978-0-674-05722-7. ^ Freidberg, Susanne (2010). Fresh : a perishable history (1st Harvard University Press pbk. ed.). Cambridge, MA: Belknap. p. 38. ISBN 978-0-674-05722-7. ^ Freidberg, Susanne (2010). Fresh : a perishable history (1st Harvard University Press pbk. ed.). Cambridge, MA: Belknap. pp. 23, 38. ISBN 978-0-674-05722-7. ^ Freidberg, Susanne (2010). Fresh : a perishable history (1st Harvard University Press pbk. ed.). Cambridge, MA: Belknap. pp. 43–45. ISBN 978-0-674-05722-7. ^ Freidberg, Susanne (2010). Fresh : a perishable history (1st Harvard University Press pbk. ed.). Cambridge, MA: Belknap. p. 44. ISBN 978-0-674-05722-7. ^ Freidberg, Susanne (2010). Fresh: a perishable history (1st Harvard University Press pbk. ed.). Cambridge, MA: Belknap. p. 45. ISBN 978-0-674-05722-7. ^ Danes-Wingett, Lind. "The Ice Car Cometh: A History of the Refrigerated Rail Car". The San Joaquin Historian. 10 (4): 2. ^ Danes-Wingett, Lind. "The Ice Car Cometh: A History of the Refrigerated Rail Car". The San Joaquin Historian. 10 (4). ^ Danes-Wingett, Lind. "The Ice Car Cometh: A History of the Refrigerated Rail Car". The San Joaquin Historian. 10 (4): 3. ^ Stover, J. (1970). "American Railroads". The Chicago History of the Railroad Refrigerator Car: 214. ^ Danes-Wingett, Lind. "The Ice Car Cometh: A History of the Refrigerated Rail Car". The San Joaquin Historian. 10 (4): 7. ^ Anderson, Oscar Edward (1953). Refrigeration in America; a history of a new technology and its impact. Princeton: Published for the University of Cincinnati by Princeton University Press. p. 156. ISBN 978-0-8046-1621-8. ^ Anderson, Oscar Edward (1953). Refrigeration in America; a history of a new technology and its impact. Princeton: Published for the University of Cincinnati by Princeton University Press. p. 158. ISBN 978-0-8046-1621-8. ^ Anderson, Oscar Edward (1953). Refrigeration in America; a history of a new technology and its impact. Princeton: Published for the University of Cincinnati by Princeton University Press. p. 168. ISBN 978-0-8046-1621-8. ^ a b Schimd, A. "The Economics of Population Settlement: Cost of Alternative Growth Patterns" (PDF). ^ Peden, R. "Farming in the Economy-Refrigeration and Sheep Farming". ^ Libecap. "The Rise of the Chicago Meat Packers and the Origins of Meat Inspection and Antitrust". Economic Inquiry 30: 242–262. ^ Rockoff, Gary M. Walton, Hugh (2010). History of the American Economy (11th ed.). Mason, OH: South-Western/Cengage Learning. pp. 336–368. ISBN 978-0-324-78661-3. ^ Beard, R. "Energy-Efficient Refrigeration for Farms". ^ Stelpflug, E (1950). "The Food Industry and the Part That Refrigeration Plays in It". Financial Analysts Journal. 6 (4): 37–39. doi:10.2469/faj.v6.n4.37. ^ Stelpflug, E. (1954). "Effect of Modern Refrigeration on the Modern Supermarket". Financial Analysts Journal. 10 (5): 63–64. doi:10.2469/faj.v10.n5.63. ^ Craig, L.; Goodwin B.; Grennes T. (2004). "The Effect of Mechanical Refrigeration on Nutrition in the United States". Social Science History. 28 (2): 325–336. doi:10.1215/01455532-28-2-325. ^ Park, B.; Shin A.; Yoo, K.; et al. (2011). "Ecological Study for Refrigerator Use, Salt, Vegetable, and Fruit Intakes, and Gastric Cancer". Cancer Causes & Control. 22 (11): 1497–1502. doi:10.1007/s10552-011-9823-7. PMID 21805052. ^ "Methods of Refrigeration: Ice Refrigeration, Dry Ice Refrigeration". Brighthub Engineering. 2008-12-22. Retrieved 2016-02-29. ^ Tušek, J.; Engelbrecht, K.; Mikkelsen, L.P.; Pryds, N. (February 2015). "Elastocaloric effect of Ni-Ti wire for application in a cooling device". Journal of Applied Physics. 117 (12): 124901. Bibcode:2015JAP...117l4901T. doi:10.1063/1.4913878. ^ Xie, Zhongjian; Sebald, Gael; Guyomar, Daniel (21 February 2017). "Temperature dependence of the elastocaloric effect in natural rubber". Physics Letters A. 381 (25–26): 2112–2116. arXiv:1604.02686. Bibcode:2017PhLA..381.2112X. doi:10.1016/j.physleta.2017.02.014. ^ Lu, Benfeng; Liu, Jian (18 May 2017). "Elastocaloric effect and superelastic stability in Ni–Mn–In–Co polycrystalline Heusler alloys: hysteresis and strain-rate effects". Scientific Reports. 7 (1): 2084. Bibcode:2017NatSR...7.2084L. doi:10.1038/s41598-017-02300-3. PMC 5437036. PMID 28522819. ^ Renato Renner (9 February 2012). "Thermodynamics: The fridge gate". Nature. 482 (7384): 164–165. Bibcode:2012Natur.482..164R. doi:10.1038/482164a. PMID 22318595. ^ "A new way to provide cooling without power". MIT News. Retrieved 30 November 2018. Andrew D. Althouse; Carl H. Turnquist; Alfred F. Bracciano (2003). Modern Refrigeration and Air Conditioning (18th ed.). Goodheart-Wilcox Publishing. ISBN 978-1-59070-280-2. Anderson, Oscar Edward (1972). Refrigeration in America: A history of a new technology and its impact. Kennikat Press. p. 344. ISBN 978-0-8046-1621-8. Shachtman, Tom (2000). Absolute Zero: And the Conquest of Cold. Mariner Books. p. 272. ISBN 978-0-618-08239-1. Woolrich, Willis Raymond (1967). The men who created cold: A history of refrigeration (1st ed.). Exposition Press. p. 212. Scroll down to "Continuous-Cycle Absorption System"
This page was last edited on 14 April 2019, at 13:54 (UTC).